Friendly, hospitable people. 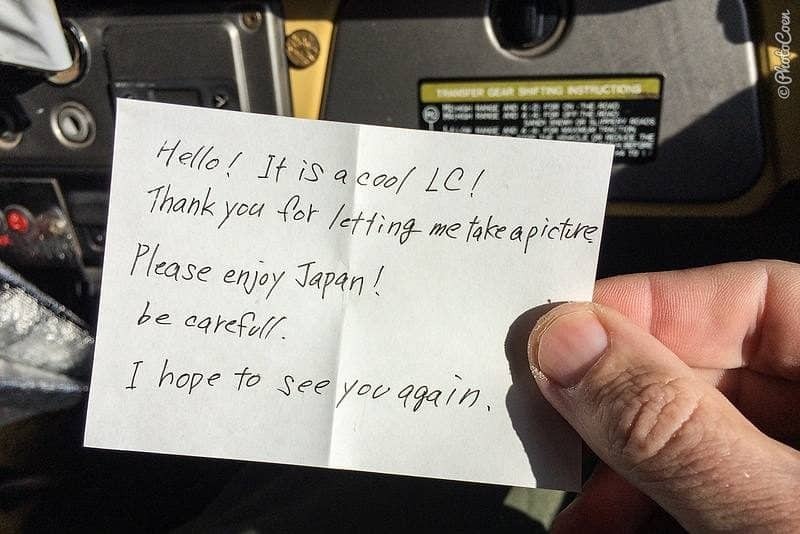 Many Japanese have approached us for a chat and even bought us coffee or a snack. 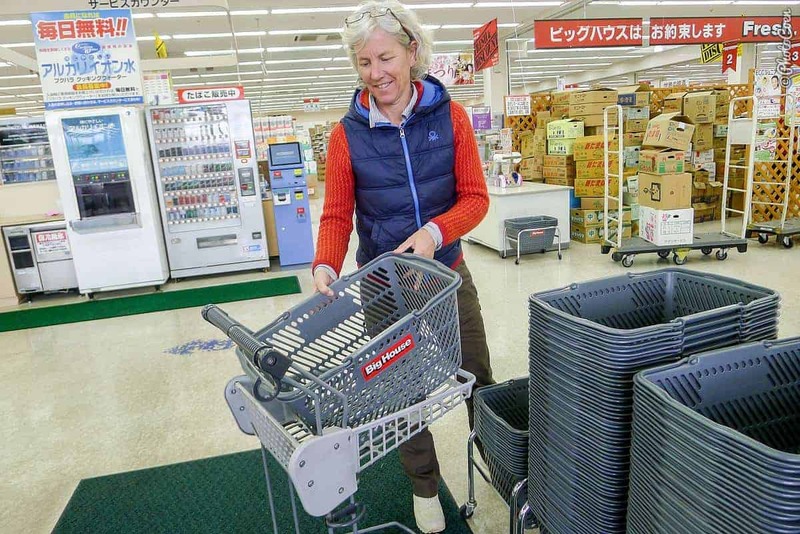 Few speak English and we don’t speak Japanese but with good will, you get anywhere. Culture. Lots of temples, historic sites, festivals, local & traditional customs, etc. As in South Korea: You will find public toilets on every corner of the street and in every subway station. Clean. With toilet paper. 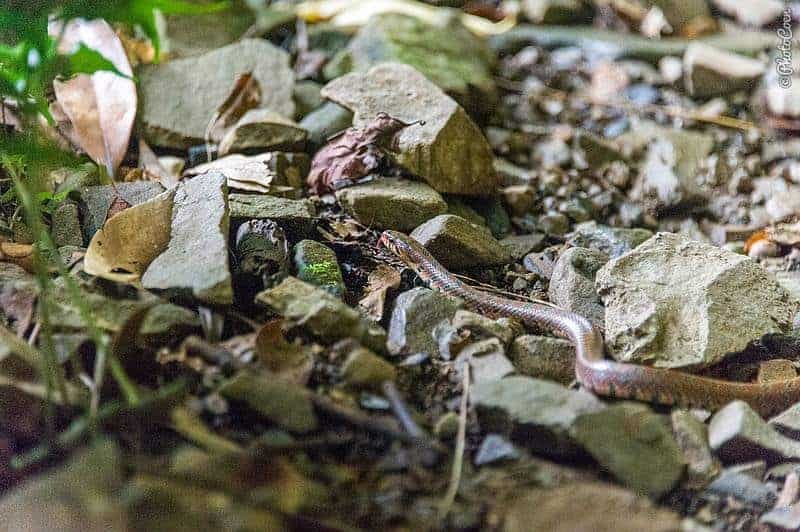 With running water. Often with soap. Bliss! Best country for baths, the so-called onsens; natural hot springs. Wildlife (although Hokkaido is an exception). 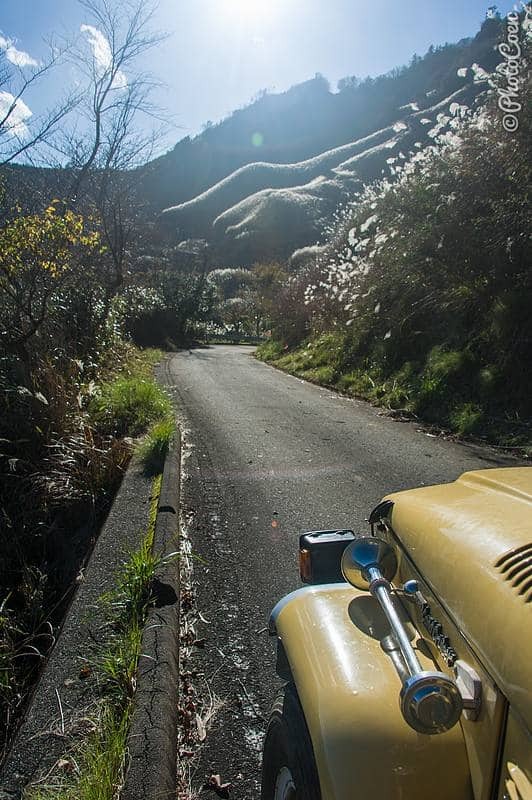 Unpaved roads, let alone serious off-roading opportunities. Mind-blowing rough camps that give you a feeling of being lost in a vast wilderness. 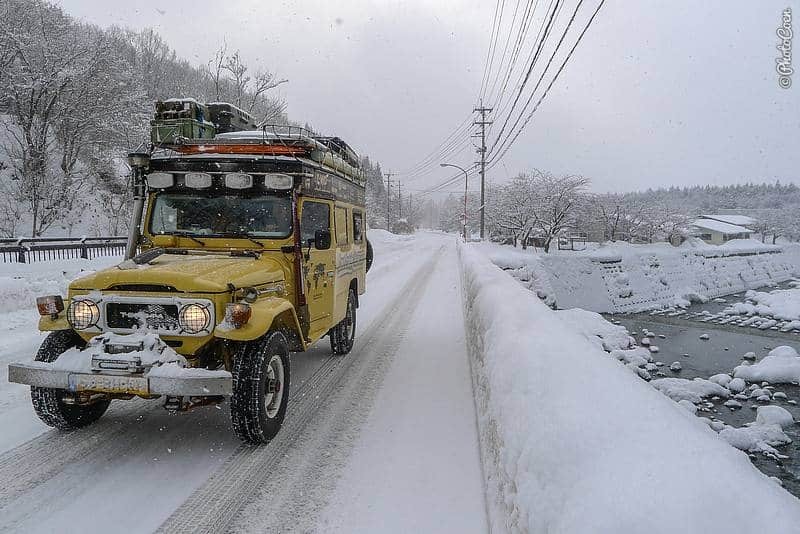 If you like winter with serious snow, come to Japan between Dec-Feb (esp. north Honshu and Hokkaido. 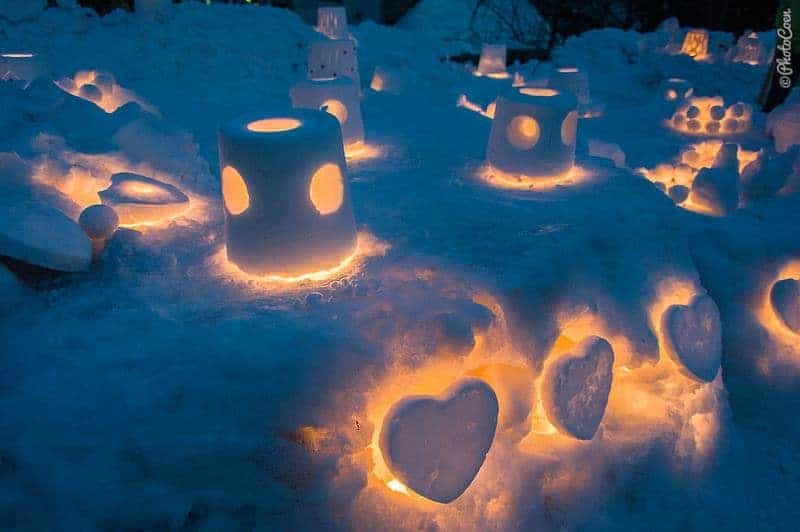 There are numerous snow festivals in both regions, like the Sapporo Snow Festival. From what we understand, but haven’t experienced ourselves, Japan’s Alp region is stunning in autumn. 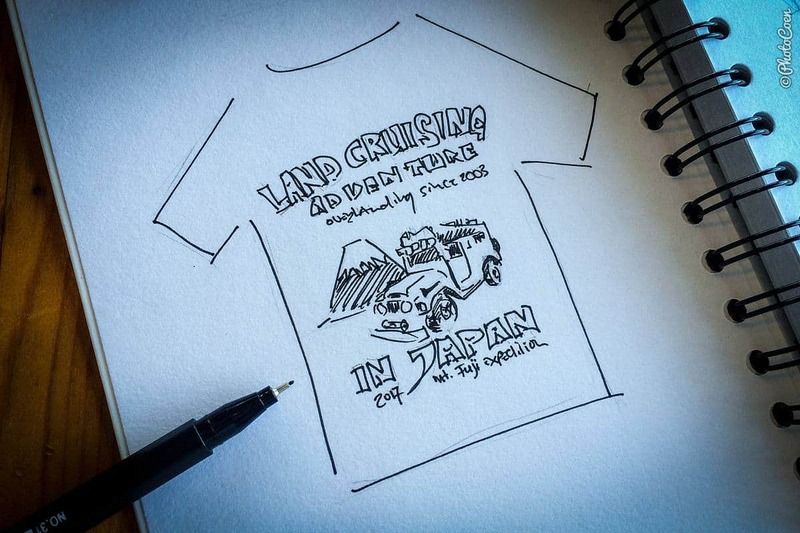 Don’t let language be a barrier to visit Japan. 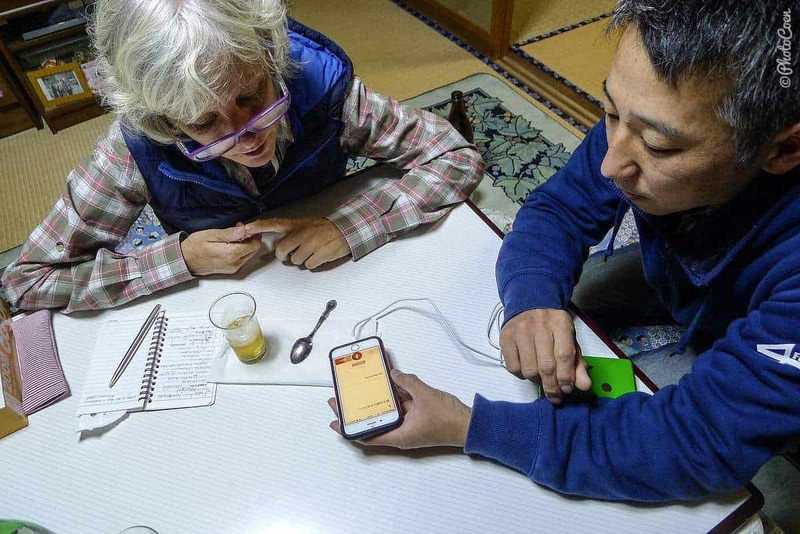 Apart from the fact that Japanese are much willing to help you and that hands & feet language gets you very far, there are electronic devices and apps to help with the language. Coen had the Google Translate app on his iPhone and he downloaded the Japanese offline package. He will hold the phone in front of a Japanese text and it will translate on the spot. Contrary to the Korean one, that wasn’t particularly accurate, it works reasonably well for Japanese. You can also use the app for speaking and having it translated on the spot (as in the photo. Whereas the translations didn’t work particularly well with Korean, they are generally understandable with the Japanese language. In this blog post are other suggestions for language apps (plus lots of other relevant apps). 5a. From South Korea to Japan. 5b. Between Honshu & Hokkaido. 5c. Between Shikoku & Kyushu. Get in touch at least 7 days in advance. Note that the ferry may get booked up quickly when Koreans and Japanese travel, especially during holidays and weekends. You need to pay at least 3 days in advance. You can pay cash or with a credit card. We checked in at 3.30pm, boarded around 7 pm, left around 9.30pm, and arrived the following morning around 6.30am. Coen checked both of us in. 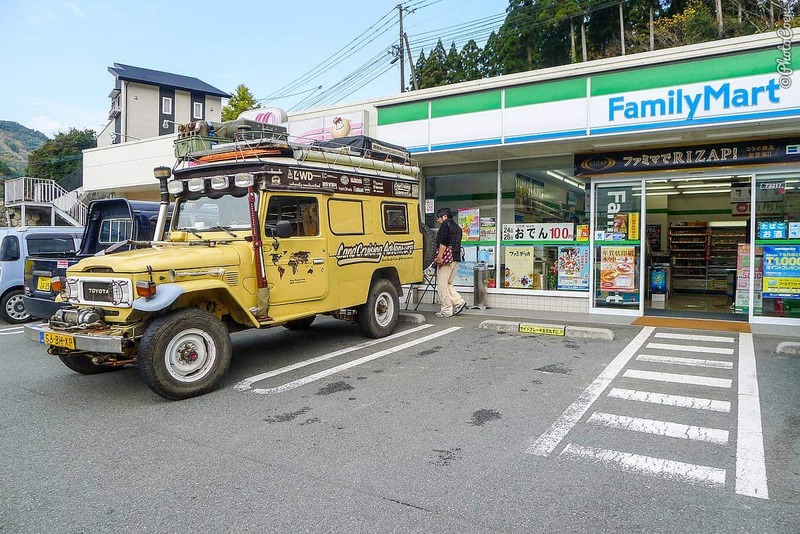 He drove the Land Cruiser through customs and did the paperwork. 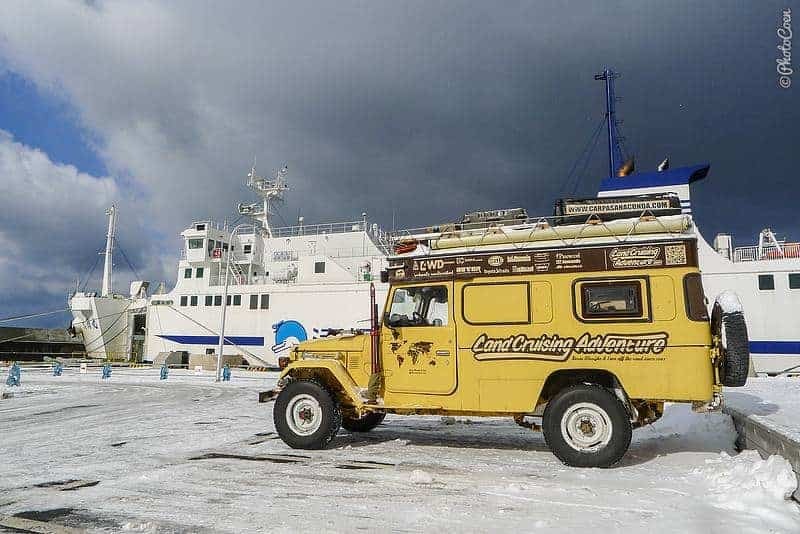 Once on board, Coen was instructed where to go so he could drive the Land Cruiser on the ferry. We lounged for the evening and we spent the night in a shared room (for about 10 people), sleeping the Korean & Japanese way on the floor on a thin mattress and with a blanket (all provided). There are even (free) hot baths on board, and there is a restaurant as well. 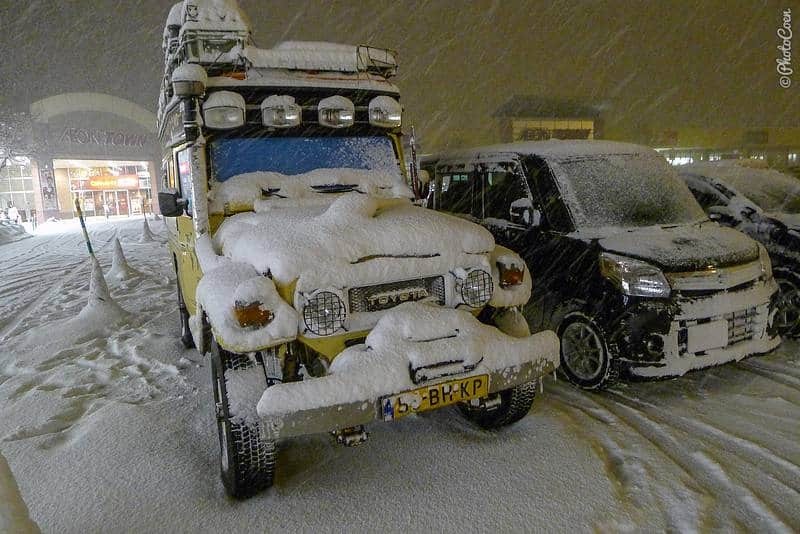 At 6.30am an employee fetched Coen so he could drive the Land Cruiser ashore. He returned on board and we both disembarked with all passengers around 8 am. As we left the ferry, Coen received a paper with a Dutch Google translation, explaining that they expected him at the Camillia Line desk at the first floor, at 8.30am, to organize the Customs paperwork. We drove out of the port around 10.30am with all papers in order. Conclusion: All very easygoing and professional. A recommended line to organize your ferry crossing with. For the car (+ driver) you have to book a roundtrip (which is valid for 3 months). The fee depends on the length of the vehicle. We paid 460,000 Won for the Land Cruiser [<5m] and the driver + an additional 90.000 Won for the passenger (one-way). No additional fees for the ferry crossing itself, but Camillia Line takes care of the customs clearance, hence charges fees for this. 20,000 yen (JPY) Surety commission, a one-time, guarantee kind of fee that you have to pay on arrival in Japan. 6,000 yen for customs clearance. (if you want you could do this yourself, but for U$60 we didn’t feel like messing with the Japanese language barrier). Before starting the customs clearance, you need to have a car insurance as well as an international drivers license. Camillia Line normally arranges this for you, but they could organize only a 3-month insurance for us + were not very helpful. As we wanted a full year to keep our options open, via Rouletout we found another insurance company: Apex Moto. Rouletout took the ferry a couple of months earlier. 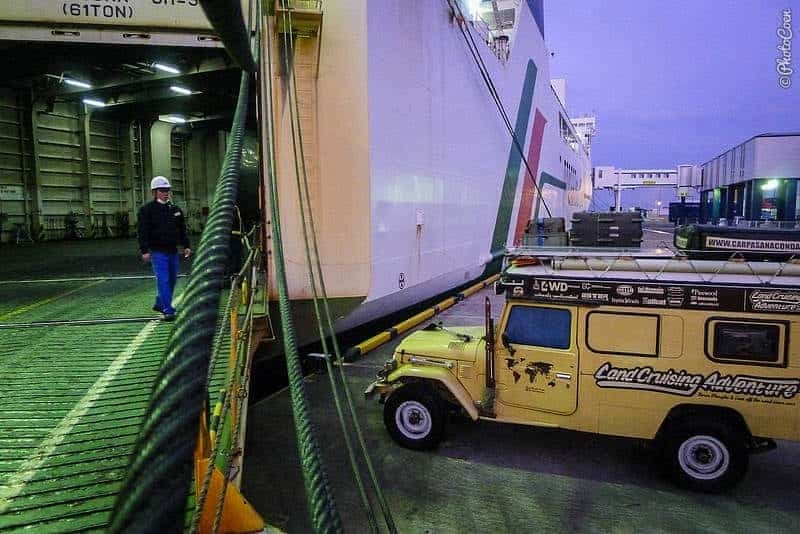 Here is their blog post on their ferry shipment. More on car insurance in our Japan Budget Report. The ferry plies twice a day, times may vary per season, as does the price. 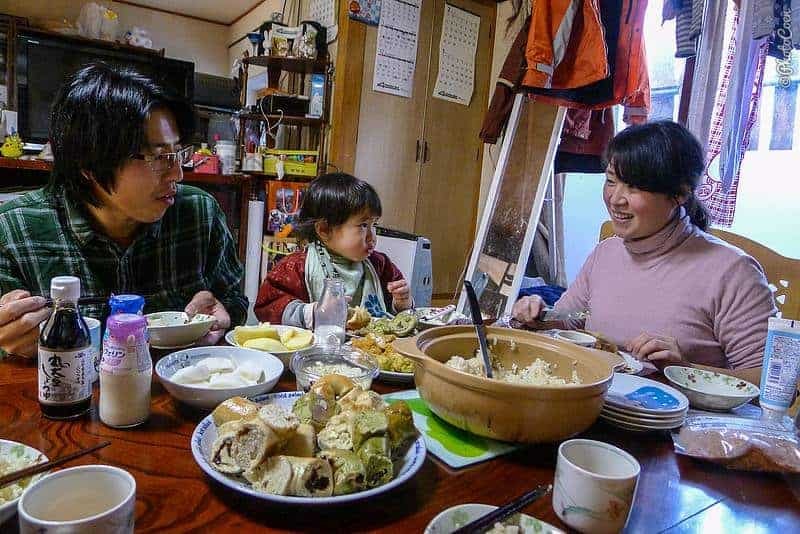 We paid 15000 yen (about US $130) for a one-way ticket, for 2 persons and 1 Land Cruiser in February (and the same fee for the return ticket in March). This is in winter; in summer the crossing is more expensive and yes, the fee is ridiculously high for a 1,5-hour ride. The tunnel you see marked on your map is for trains only. We paid with our visa card. There are a number of places on both Shikoku and Kyushu where you will find a ferry to go sail to the other island. We ferried from Sukumo to Saiki. We drove to the port, learned there was a ferry going that same afternoon, paid, and crossed to Kyushu. Easy as that. 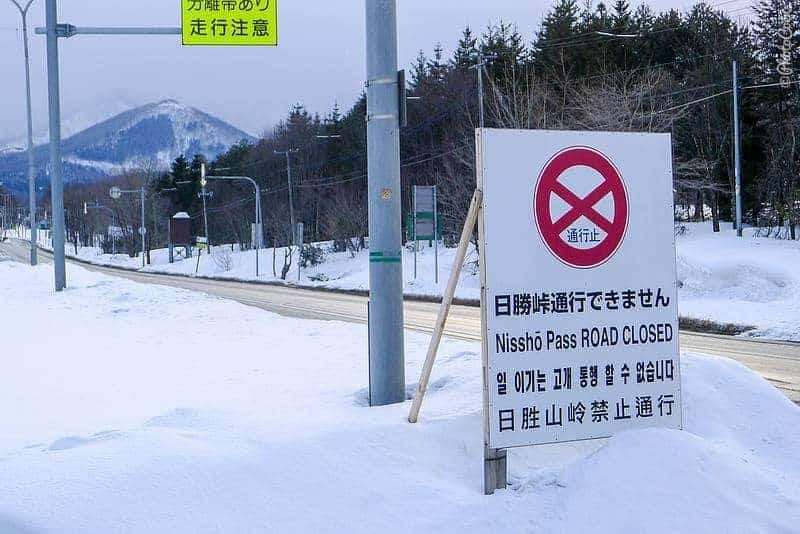 I think the crossing took about three hours and cost 13,910 yen. 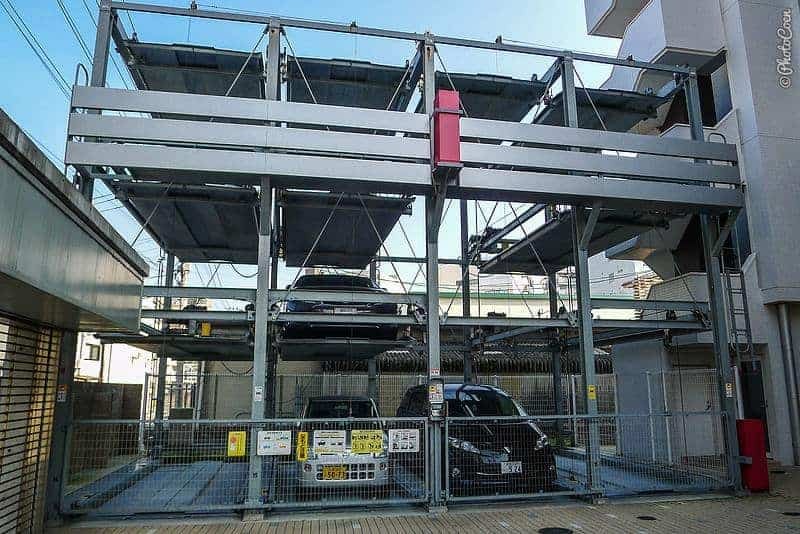 Nifty, layered parking lots (for private use only). Most, if not all, roads are asphalted although not necessarily extremely smoothly – that is for our stiffly suspensioned Land Cruiser. 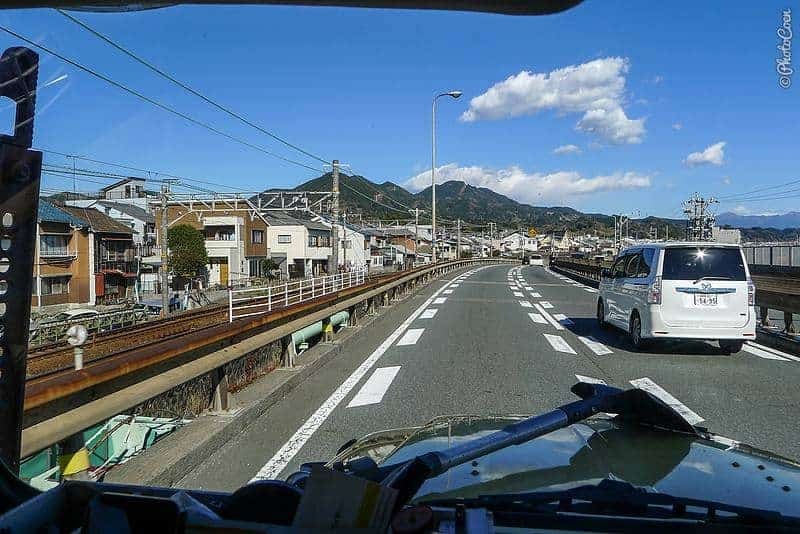 I can’t take notes while driving on Japan’s asphalted roads (that’s how I compare and judge the state of roads in different countries). Many are patched up or consist of pieces of concrete. I will add that the toll roads (Expressways) may be of top quality, but they are beyond our budget so I can’t tell. The toll roads, the so-called National Expressways. They are expensive but do speed up your journey considerably. The speed limit is 100 km/h and apparently even a minimum speed of 50km/h according to Wikipedia. On signboards, these Expressways are indicated in green. Occasionally it is confusing: you follow blue-colored signs in bigger cities but are led on a toll road. Be on the lookout for a road bypassing it, there must be a parallel road next to or under it. A typical scene in the city. 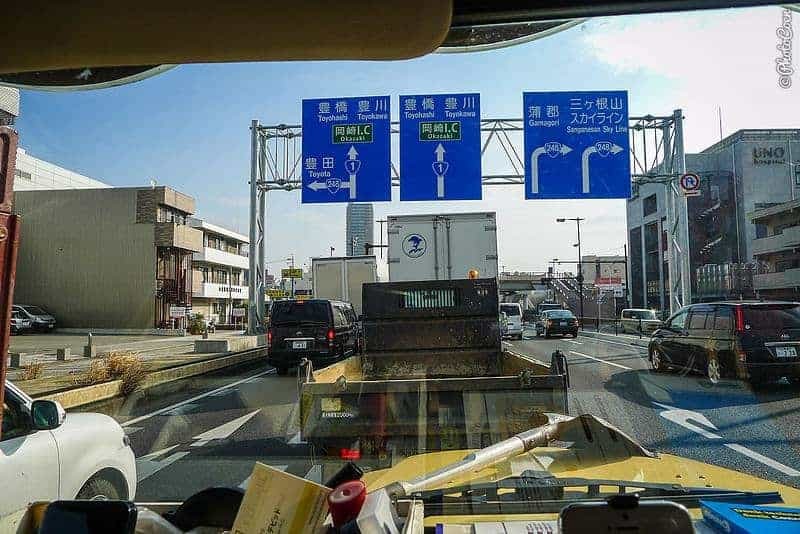 In Japan you drive on the left side of the road and there is an overload of signs in this country. 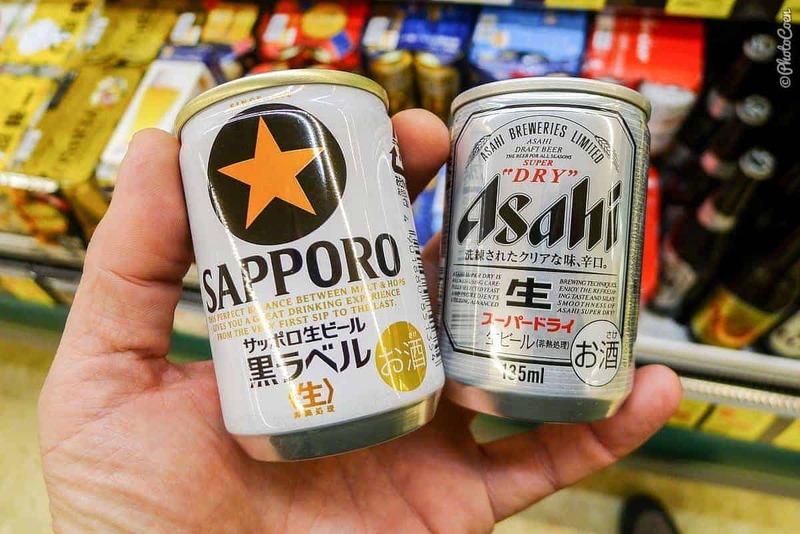 Japanese drivers are overly careful drivers and extremely respectful of the law, in most respects, that is, particularly when it comes to drinking and driving. 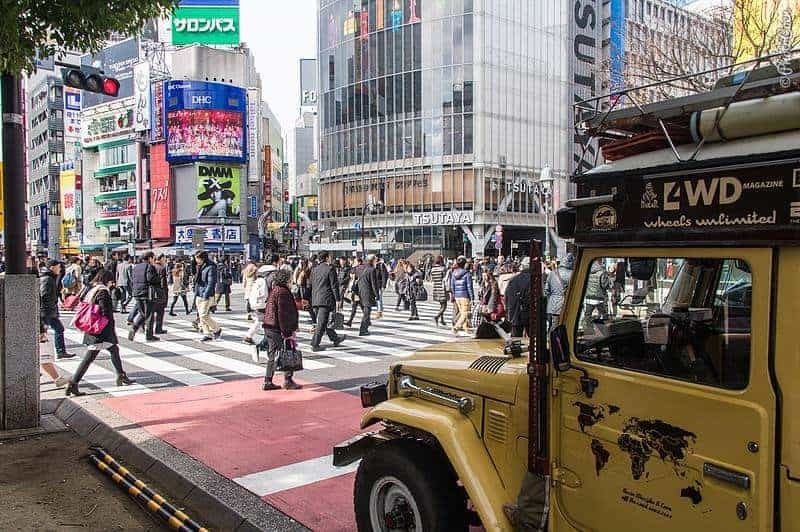 (Babies, toddlers, kids in front seats without seat belts appear no problem and we’ve seen more drivers texting or calling on their phone in Japan than in whole of South America). Railroad crossings are electronically guarded by lights and almost always with barriers, yet you will find every driver stop and glance left and right before crossing it. This is a law. We are flabbergasted by the inefficient traffic light system. Japan being high-tech and all. We haven’t come across any electronic sensing system in the asphalt. So the traffic lights are looped in a fixed system (which includes the pedestrian crossings!). Nor are any green light waves. Bring a lot of patience to this country, which you’ll need when crossing cities (not using the Expressways I mean)! 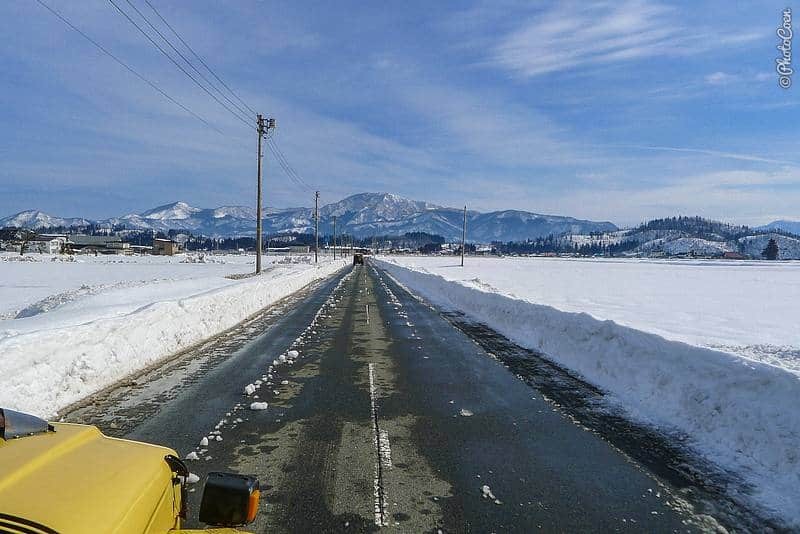 In winter we were impressed with which speed they cleared the roads. 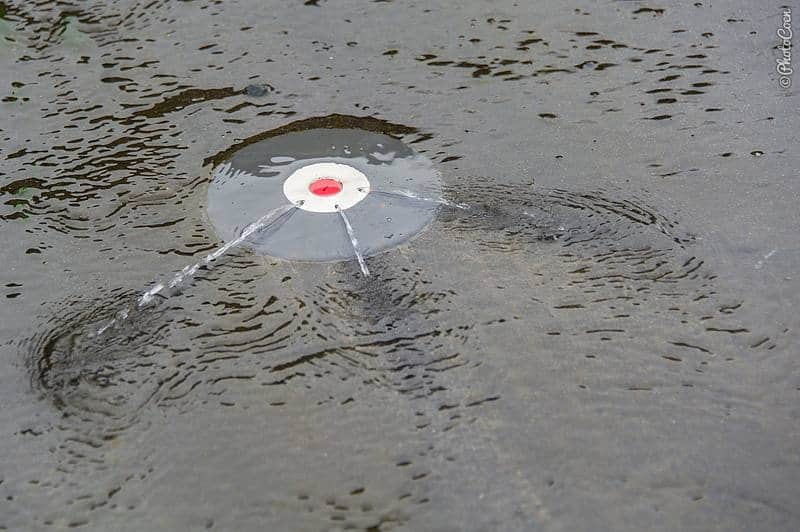 In some roads they have these sprinklers to keep to melt the snow. There are very few police checks and cameras are conspicuously absent. But don’t be fooled – or so we were regularly told. Once caught, whether speeding or drinking with just a drop of alcohol and you’ll be severely punished. 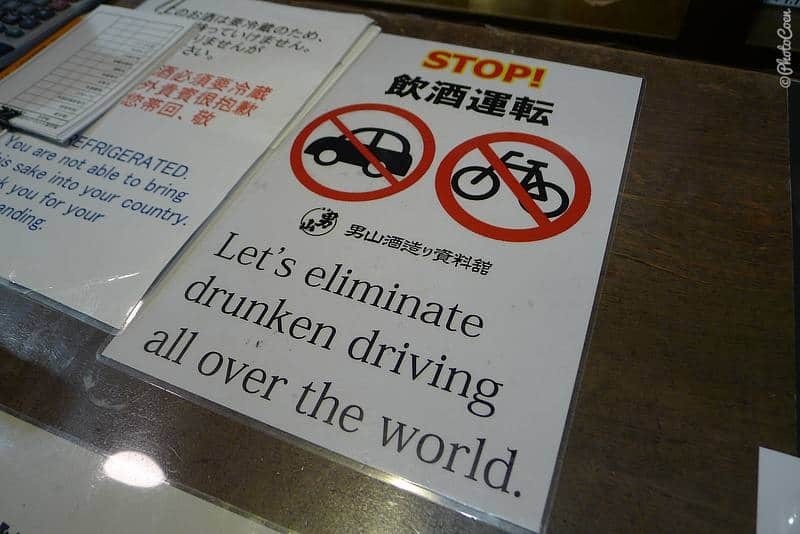 According to this document (with lots of other useful information on traffic rules) fines for drunk driving are 500,000-1,000,000 yen or 3-5 years in jail. Thus far the police have stopped us three times: once on Kyushu island, once on Honshu and once on Hokkaido. The reason was our foreign license plate and the officers wondered whether that was allowed (obviously it is). They were thorough in checking paperwork but kind and just taking their job (extremely) serious. MapsMe automatically steers you to toll roads. For that reason, Coen preferred using an Android tablet loaded with OsmAnd, however, it was terribly slow to update and a pain to use the user interface. Japan has its own navigation system. So most of the time MapsMe was on the iPhone and we choose routes manually for a shorter distance, which worked perfectly. The last update includes hiking and biking, which is handy as it incorporates elevation charts. Coen wrote about navigation systems here. 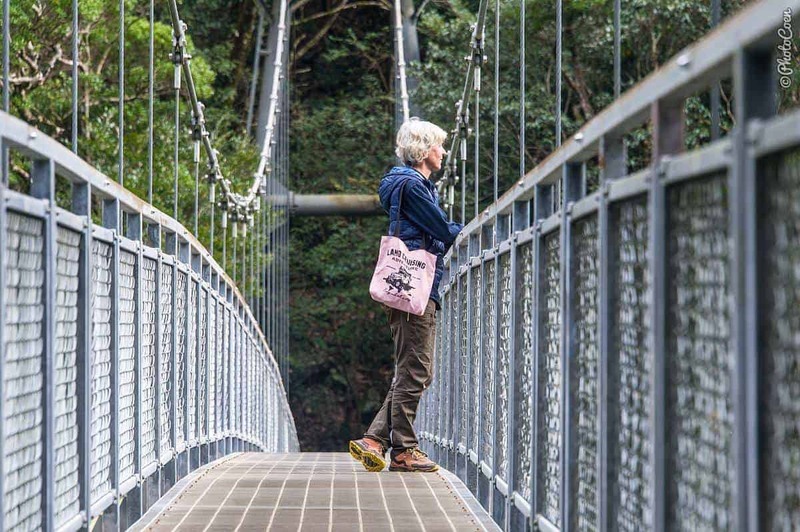 To have an overview of the country we still love using our Reise Know How roadmaps (easy to buy on Amazon, find it here). For detailed maps we source local maps. 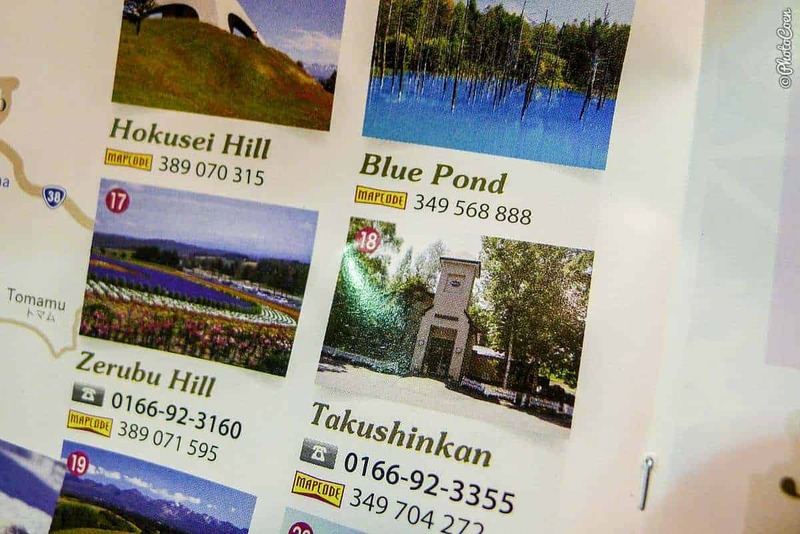 Japan has tourist information centers all over the place, especially in (bigger) train and bus stations and at michi no ekis (road stations, read about them here). 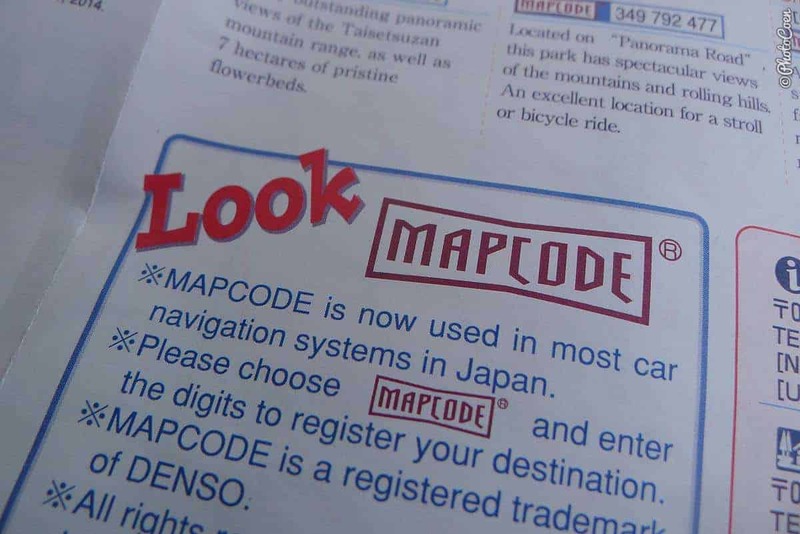 The majority of the info is in Japanese but maps helped nonetheless. 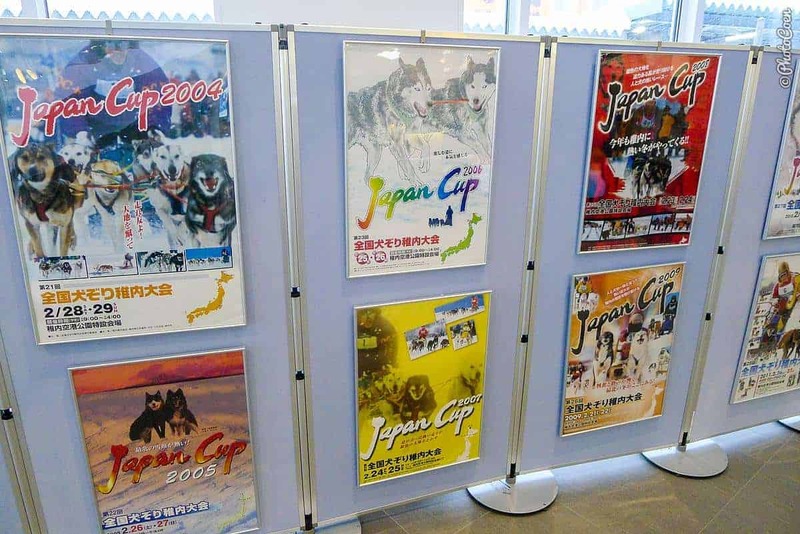 Michi no ekis often have posters announcing events or highlighting local sights. We are ambassadors of Insight Guides. 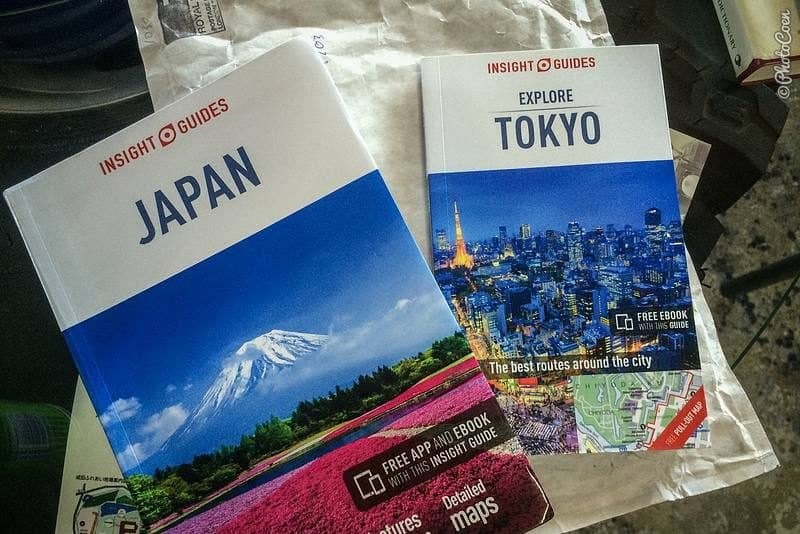 Insight Guides focus on sightseeing (rather than endless lists with practical info on places to sleep & eat) and come with lots of beautiful pictures, which helps me get a feel for a place. In the back is a short overview with practical information of websites, addresses, and phone numbers. 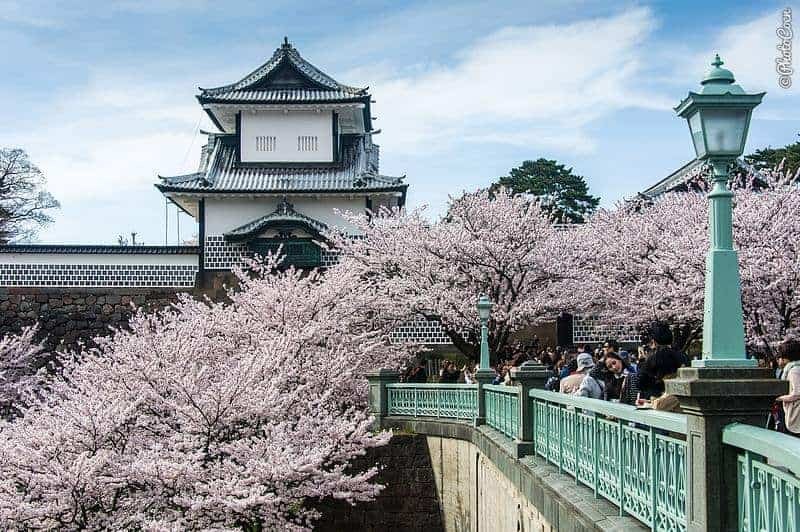 We used the Japan Insight Guide (find it here) and the Tokio guidebook with clearly outlined walking tours – find it here. Information we find in museums. Tourist information offices of which, as I said before, there are plenty in this country. I read (and am still reading) a number of books on Japan, non-fiction and novels. Most gave a good insight into Japan (particularly its modern history). We have a water tank with a filter system in the car so we don’t have to worry about filtered water. What we understand from Japanese is that almost all water is safe to drink. When not, at a few Michi no Ekis or at hot springs if I remember correctly, it is clearly signed. No big shopping carts to be found! 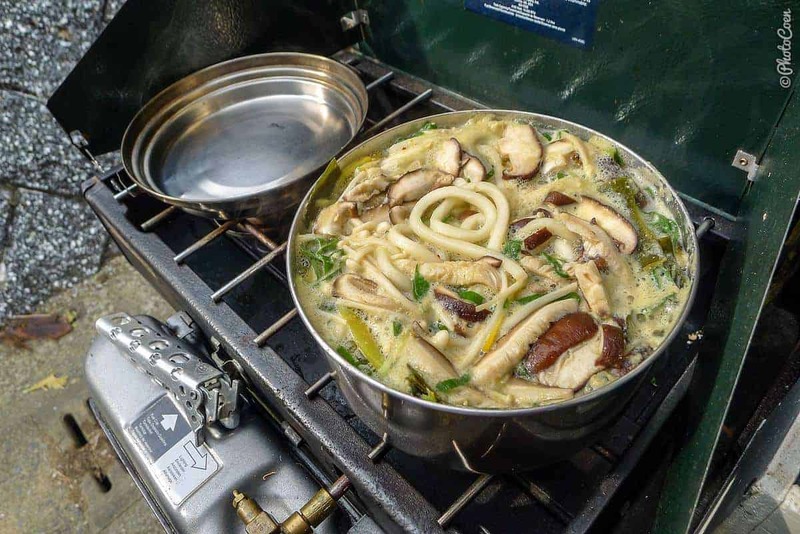 Miso soup with local ingredients. 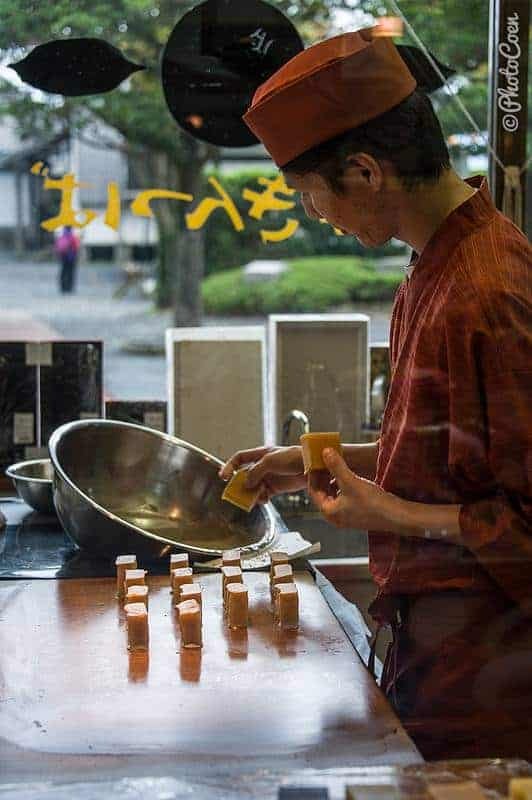 There is enough to write several books about food in Japan, so I won’t do that here. 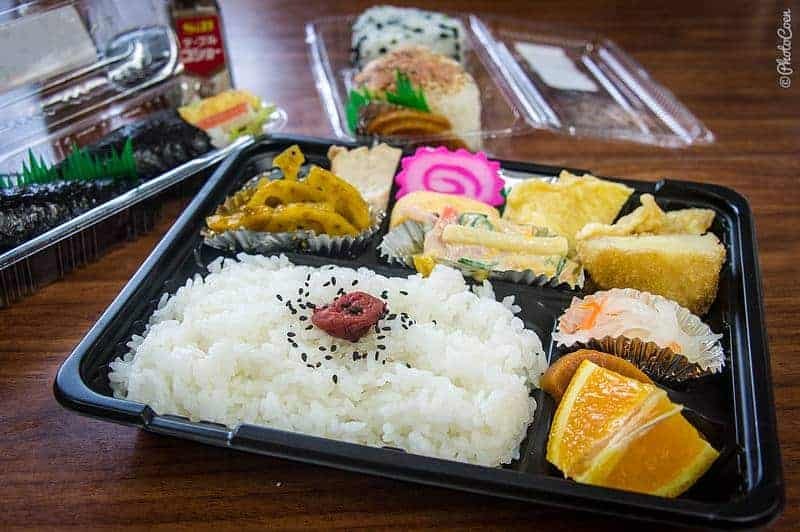 But a good tip for on the road: onigiris and bentos. 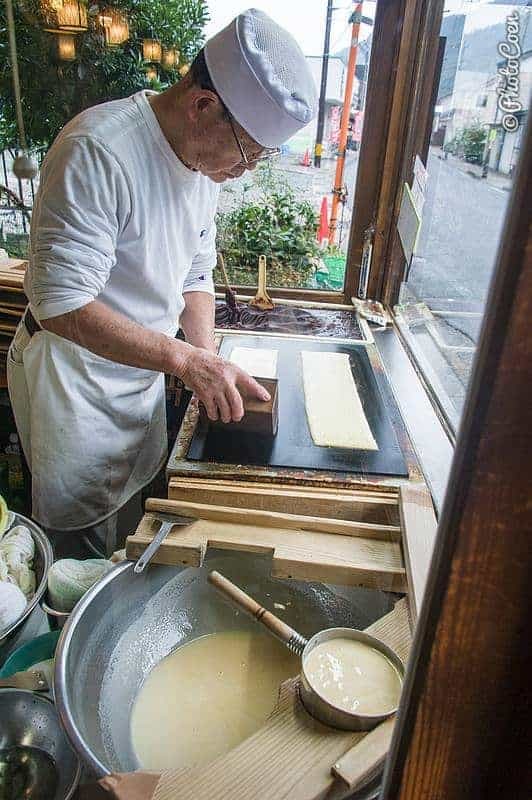 The first are rice balls (shaped round or triangular) filled with meat, seaweed, mushrooms or vegetables. Bentos are set-meals packed in boxes for on the go. 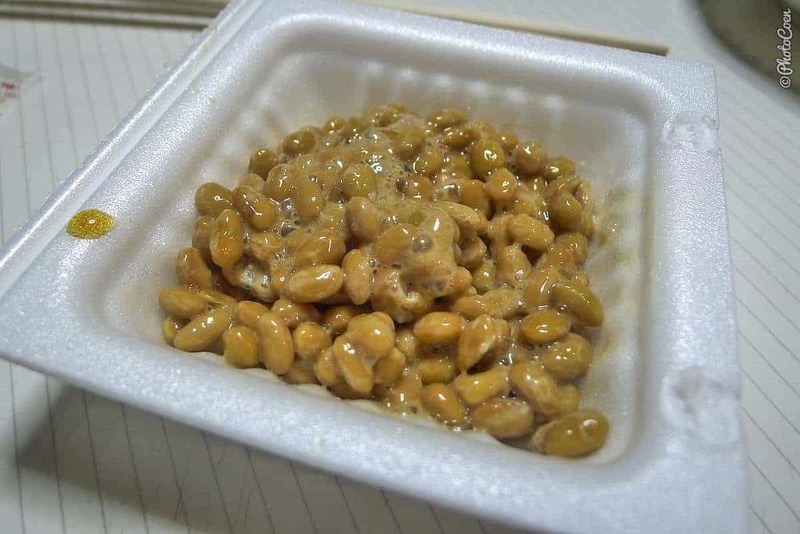 You can find these on-the-road foods at any convenience store (7-Eleven, Lawson, Family Mart, among others), in train stations and supermarkets. Here’s an article I wrote about on-the-road snacks. 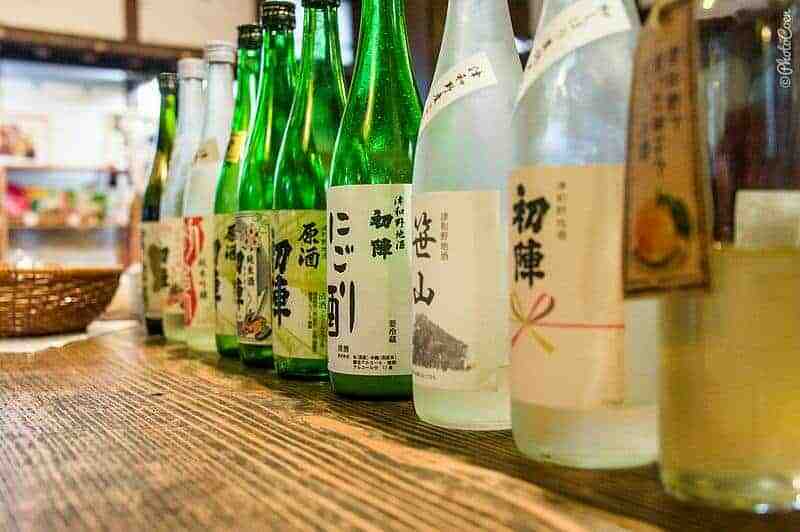 In many places are sake museums, or places to taste sake. These convenience stores offer more than food and you will find them on every corner of the street. They will become your best friends. Why? Lawson & 7-Eleven have good coffee, made from freshly ground beans, for the equivalent of a dollar (100 yen). ATMs at the 7-Eleven work with foreign debit cards and all 7-Elevens have ATMs. It’s almost impossible to find public trash cans in this country. Everything is elaborately packaged in this country and packaging of produce generally serves very well as garbage bags, which I dispose of in the small garbage cans at convenience stores. Lawson & 7-Eleven both have WiFi, but you have to sign up every hour and there is generally a maximum of 3 hours (7-Eleven) and 5 (Lawson), although it does seem to differ per place/day. 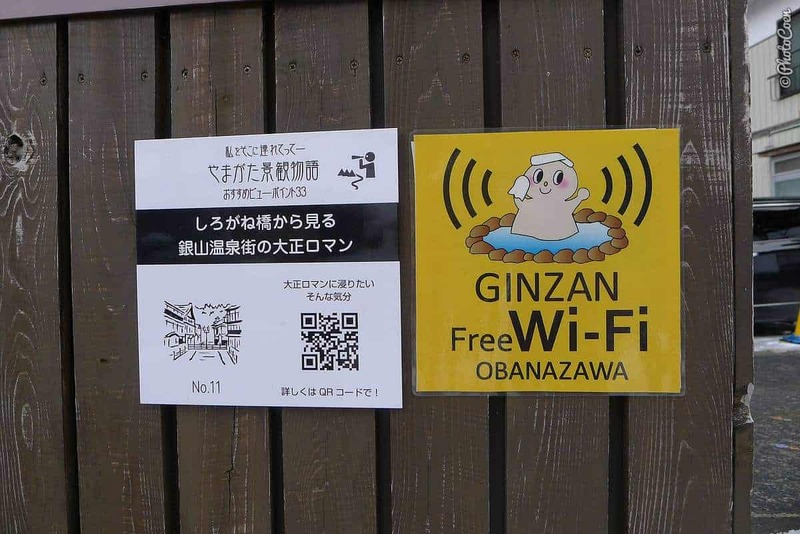 For your phone, download the app Japan Wi-Fi where you register once and after you’ve logged in you’re set to go. 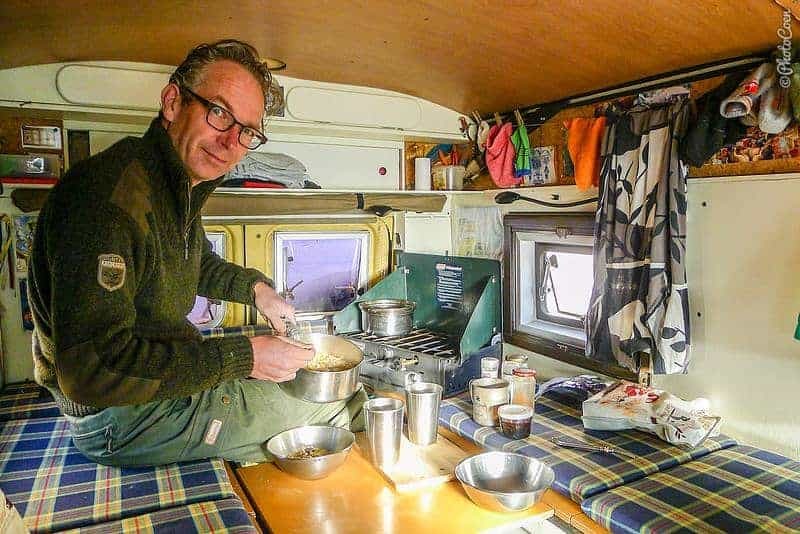 Overlanding Facebook groups among which Overland to Asia. 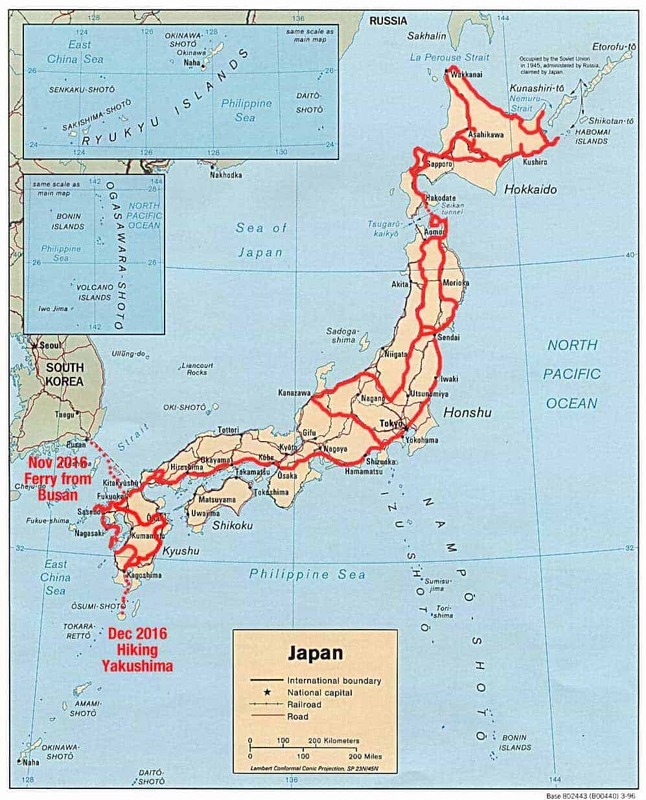 Japan Facebook groups among which Free Camping & Hot Springs Japan, Bicycle Touring & Hiking. To read about our budget in Japan and all other money-related matters, check out Japan Budget Report. 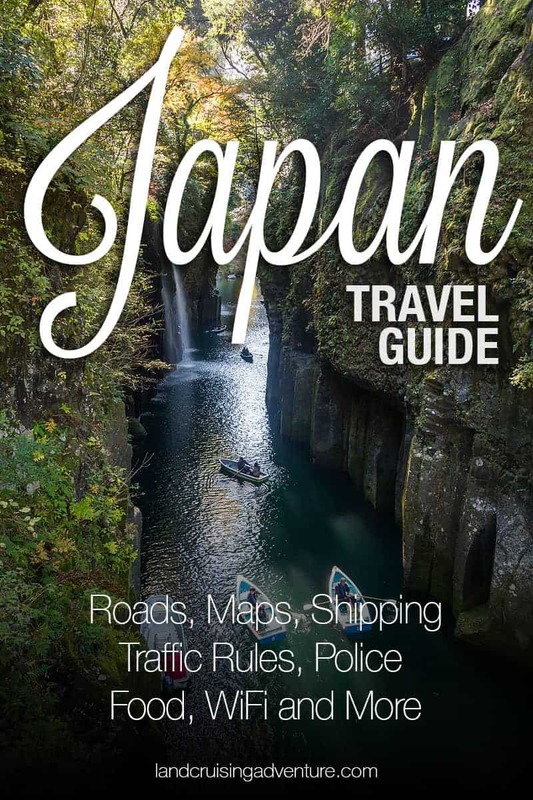 We hope you find this Japan Travel Guide useful. Anything you missed? Feel free to leave a comment or question in the comment section below and we’ll answer it asap! Yesterday we took the Espressway from Sendai to Nikko and it was smooth and faster due to the lack of traffic lights. But maximum speed was 80 km/h most of the time if not 50 in parts under construction. Price 5500 yen. 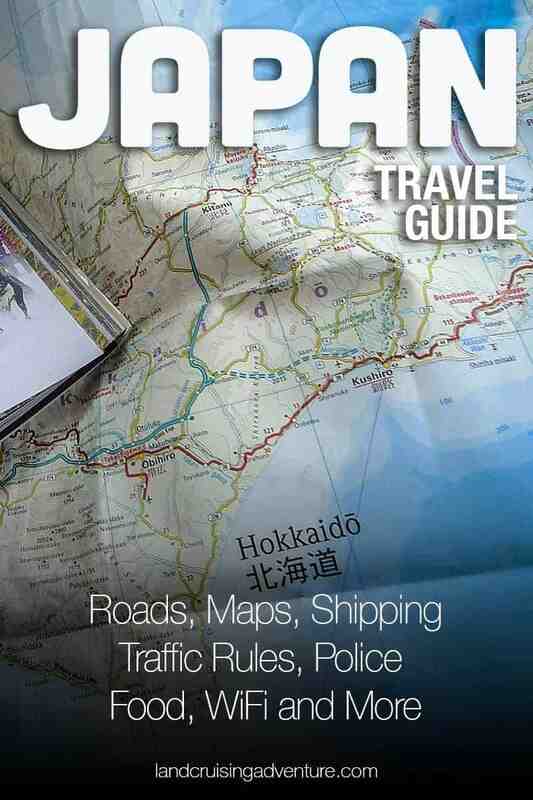 For navigation we use Googlemaps, which proved reliable on Honshu during the last 3 weeks. Did you need the Carnet de Passage for the car, when entering Fukuoka from Korea? We had one when we shipped from Vladivostok to Sakaiminato and two bikers didn’t. 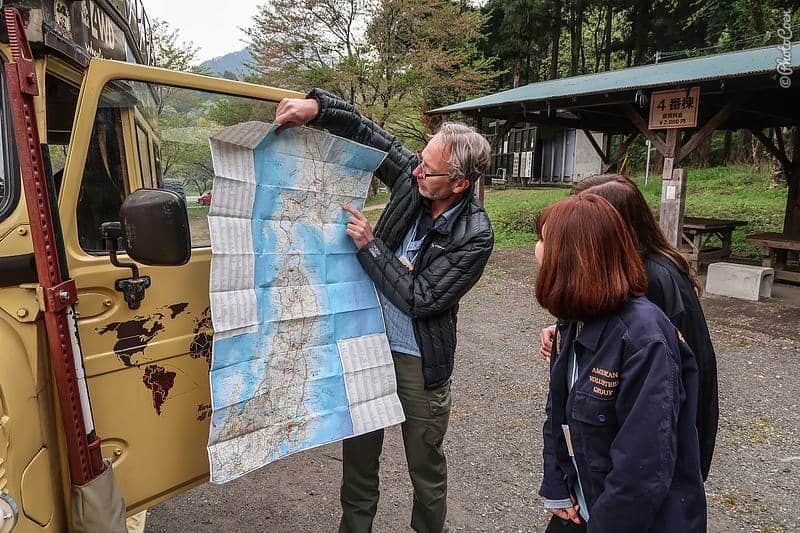 Apart from the fact that the CdP costed us about 320 €, the two bikers were cheaper off without because we had to take a taxi (about 100 €) to Matsue to validate the CdP at the Japanese Automobile Club before the customs wanted to stamp the CdP. 420 € = about 420 litres of fuel = 3500 km’s! The bikers did the paperwork in about 2 hrs, we were busy for about 4 hrs. Hi Filiep, no we didn’t need a Carnet. 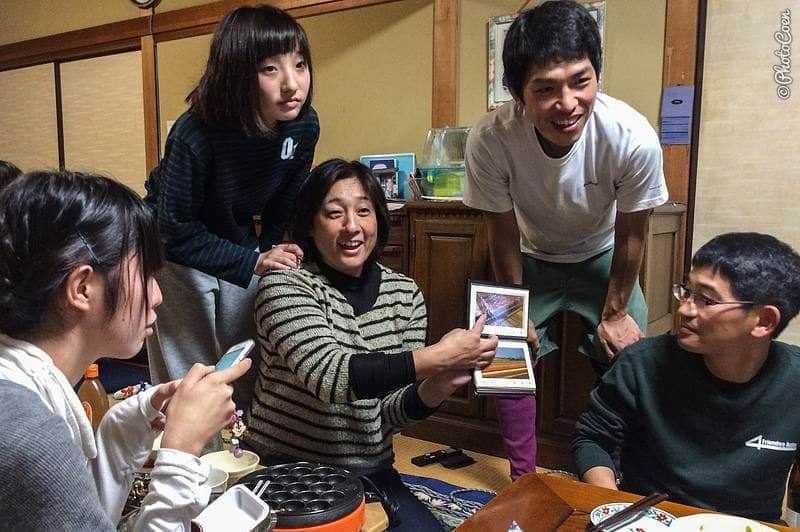 We understand that when you ferry to Japan, you don’t need it. We heard people say you need one when arriving by container, but we haven’t verified that. I think in total we also took some 2 hrs for the paperwork, including Coen’s walk to the post office to pick up the insurance papers he had organized beforehand.